W. Lincoln Hawkins, a pioneer in chemical engineering and the uses of plastics, was a leader in discovering the factors limiting the life of plastics and in developing life extending additives as a practical means for conservation of materials. He studied chemistry at Rensselaer Polytechnic Institute, where he was one of only two black students in the school in 1928. He earned an M.S. from Howard University in 1934 and completed his Ph.D. at McGill University in 1938. 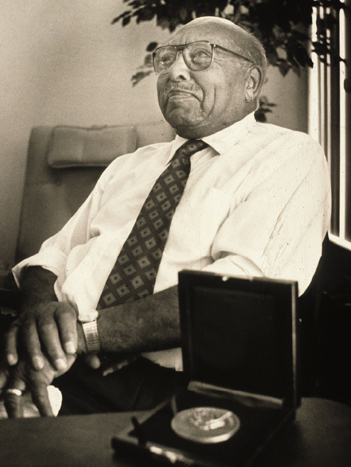 After a research fellowship at Columbia University, he joined Bell Laboratories in 1942 (the first African American scientist on their staff). His work there led to the invention of the synergistic system of chemical stabilization used throughout the world in the manufacture of plastic cable sheath. Dr. Hawkins’s research was of significant importance in developing ways to recycle plastics. At Bell Labs, he served as head of plastics chemistry research and assistant director of the Chemical Research Laboratory until his retirement in 1976. In 1975 he was elected to membership in the National Academy of Engineering. Through a summer program of the American Chemical Society and as a board member of several educational institutions, he was active in encouraging disadvantaged youths to understand and pursue careers in chemistry.